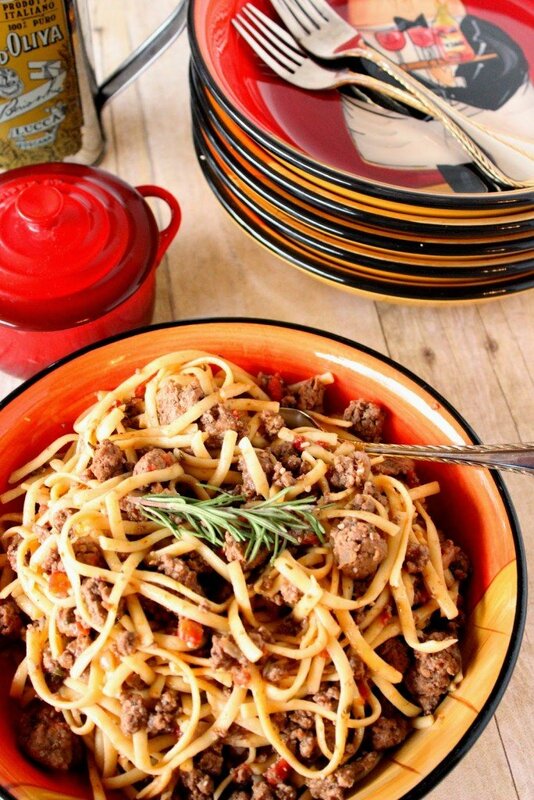 Lamb Linguine with Rosemary will satisfy the heartiest meat and pasta lovers alike. It comes together in a snap and will be on your dinner table in under 30 minutes. I can hardly believe we’re only days away from 2015. For me, the beginning of a new year is always the most exciting time of the year. New hopes and dreams are only a moment away. All you have to do is grab hold and actively make the changes that can (and will) take your life in a brand new direction. The place you’re meant to be. 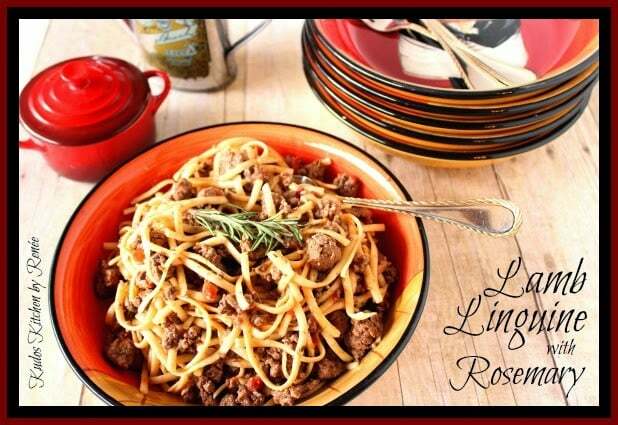 What has this recipe for Lamb Linguine with Rosemary got to do with changes and the new year, you ask? Nothing really. It’s just a good way for me to segue and let you know that as we move into 2015 my blog and I will be making a few healthier changes. Over the past year, I’ve tried to post at least 4 to 5 times a week in hopes of growing my readership. While I love being able to post delicious recipes on a regular basis, it seems as though that not only has my readership grown…so have I! I’m at the highest weight I’ve ever been, and I’m quite unhappy with extra pounds I find myself carrying around. Due to this fact, I’ve decided that going forward I will be focusing the majority of my recipes on healthier, lower calorie yet still delicious dishes. That said, from time to time I’m still planning on popping in some decadent and rich desserts along with entrees, sides and appetizers that won’t necessarily qualify as healthy or low-calorie. However, when eaten in proportion to a well-balanced diet, they will be dishes that can be considered “treats” on an occasional basis, but certainly not a daily indulgence. 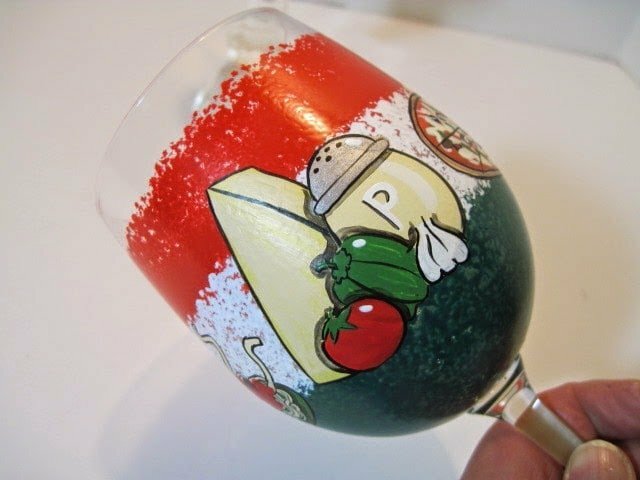 The other thing you’ll notice about my blog going forward is that I’ll be taking some of the focus from the food and placing it back again on my hand painted glassware items. I’m so looking forward to once again sharing with you the individual posts about the pieces I’m working on, along with step-by-step photos that I hope you’ll find interesting and entertaining. I seriously can hardly wait! The third and final thing that I plan on writing and occasionally sharing with you about is my personal weight loss journey. I have a few eating and fitness programs in the queue for the start of 2015 (cliche I know). That said, I’ve actually been preparing myself mentally and physically for the past few weeks, and I’m happy to report that I’ve already lost a few pounds just by being mindful of how (and why) I’m eating AND drinking. It’s not always been a hunger thing for me, and I realize how much my positive mindset will play a part in my success. Now, back to the recipe of Lamb Linguine with Rosemary. After all, we still have a few more days to live on the edge. LOL. 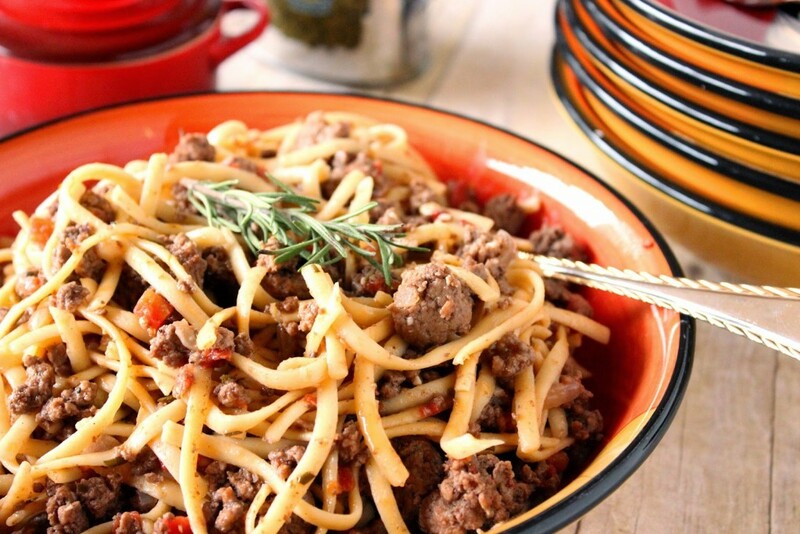 In all actuality, you can lighten this recipe up, and make it healthier by using ground turkey in place of the lamb, and by substituting whole grain pasta (of any shape) for the linguine. And, of course by eating the proper portion size! 🙂 Serve this pasta alongside a nice big salad that is loaded with veggies (not dressing) and you’re well on your way to eating healthy, and smart! 1 box linguine (cooked according to package directions), reserving 3/4 cup of the cooked pasta water. -In a large skillet, brown the ground lamb over medium/high heat. Add the onion and red pepper flakes. Cook, stirring occasionally for 1-2 minutes. -Reduce the heat to low and stir in the beef stock, wine, butter, tomatoes, vinegar and the pasta water. -Cook, stirring occasionally, to slightly reduce (approximately 5 minutes). -Toss the lamb and sauce with the cooked pasta. -Garnish with Parmesan cheese if desired, and serve. I hope you’ve enjoyed this recipe as much as I’ve enjoyed bringing it to you. If anything I write about and share with you here is helpful and/or inspiring to you and your journey, that makes me very, very happy! Here’s wishing you a happy, healthy new year where nothing is beyond your reach! Kudos Kitchen by Renée ~ Where food, art, health, and fun collide on a regular basis! Thanks for visiting me in my Kudos Kitchen. I’ve enjoyed having you here! Light Creamed Roasted Vegetable Soup for #SundaySupper "A Lighter New Year"
I look forward to the exciting new direction with your blog! Happy New Year! I'm right there in that (weighed down) boat, Renee. And boy is it harder to get rid of those pounds now that it was ten years ago. Bleck. Best of luck on your goals for the new year, I look forward to going along on the journey. In the meantime, pass me a plate of this goodness. 🙂 Happy New Year! Looking forward to some healthier dishes on your blog!! I'm sure they will be just as delicious! 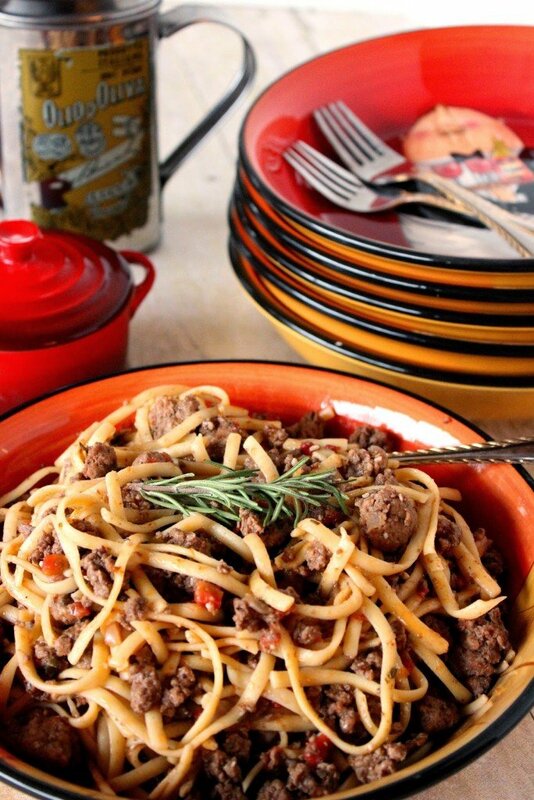 I'm totally ready for 2015 and I'm really, REALLY ready for this Lamb Linguine! Good luck on your weight loss journey! I'm looking forward to seeing your blog's new direction! And your painted creations!